The B-1 Lancer is a strategic bomber used by the United States Air Force. Its origins began in the 1960s as a supersonic bomber with sufficient range and payload to replace the B-52 Stratofortress, but developed primarily into a low-level, subsonic penetrator with long range. The design was canceled and re-instated multiple times over its lengthy development history, as the theory of strategic balance changed from flexible response to mutually assured destruction and back again. It finally entered service over twenty years after first being studied. The B-1B production version has been in service with the United States Air Force (USAF) since 1986. The Lancer serves as the supersonic-capable component of the USAF's long-range bomber force, along with the subsonic B-52 and B-2 Spirit. As with official popular names of other aircraft, the Lancer is commonly called the "Bone" (originally from "B-One") within the USAF. With the retirement of the EF-111 Raven in 1998 and the F-14 Tomcat in 2006, the B-1B is the last variable-sweep wing aircraft remaining in U.S. military inventory. The B-1 was conceived as the Advanced Manned Strategic Aircraft (AMSA) program circa 1965. AMSA was the last in a series of programs through the 1960s that looked at replacing the B-52 with a multi-role supersonic aircraft capable of long-range bombing and missile launching with nuclear weapons. A series of cancellations led to its service introduction being greatly delayed until the later half of the 1980s, over twenty years after the program first started. In 1955, the USAF released system requirements for a heavy bomber with the B-52's range and payload capabilities, and the supersonic speed of the B-58, in order to replace both of these bombers by 1965. The initial requirements called for a Mach 0.9 cruise speed with a Mach 2+ dash capability. However during the design phase new fuels and techniques evolved that would allow an aircraft with similar range to cruise all the way to its target at high speeds. The Air Force asked for new proposals based on these advances, and this work would eventually lead to the B-70 Valkyrie. The Valkyrie was a large six-engine bomber designed to fly at very high altitudes at Mach 3 to avoid defending interceptors, the only effective anti-bomber weapon at that time. Altitude alone was proving so difficult a problem that Soviet interceptors continued to fail to intercept the Lockheed U-2, running out of fuel before reaching a suitable firing point. Given the speed and altitude of the Valkyrie, the defense would have only a few minutes to respond to an attack, and even small numbers of the bombers attacking simultaneously would ensure that most would fly right by the interceptors, regardless of how much warning time they had. The introduction of effective anti-aircraft surface-to-air missiles (SAMs) rendered high altitude operation dangerous. The ability of SAMs to intercept a high-altitude target was demonstrated by the downing of Gary Powers' U-2 in 1960, and continued improvements in the Soviet SAMs placed all high-altitude aircraft at increasing risk. The USAF Strategic Air Command had recognized the risk with high altitude bombing and began moving to low-level penetration before the U-2 downing. This greatly reduces radar detection distances while at that time SAMs were ineffective and interceptors less effective against low flying aircraft. Also the flight path to a target could be routed around known anti-aircraft sites, and the landscape could be used to the bomber's advantage to stay out of the radar's line-of-sight operation. Aircraft speed became much less important. The targets themselves often had defenses located nearby to prevent this sort of approach all the way in, but stand-off weapons such as the AGM-69 SRAM provided an attack capability from outside the defensive missile's range. Low-altitude flight also made the bombers very difficult to detect from aircraft at higher altitudes, including interceptors, as radar systems of that generation could not "look down" due to the clutter that resulted from ground reflections. Operations at low levels would limit the B-70 to subsonic speed, while dramatically decreasing its range due to much higher fuel requirements. The result would be an aircraft with similar speed but much less range than the B-52 it would have replaced. This same problem had occurred with the B-58, another high-speed aircraft that was forced into the low-level role to avoid missile defenses. Considerable effort was spent on the B-58's design to gain medium-range Mach 2 performance, but at low altitudes it had strictly subsonic performance and such dramatically reduced range that it limited the selection of targets that could be assigned to it. Unsuited for this new role, the viability of the B-70 as a bomber was questioned. Citing high cost, a growing ICBM force, and poor survivability against missiles, the operational fleet was canceled in 1961 by President John F. Kennedy, and the program was changed to a supersonic research program. Although never intended for the low-level role, the B-52's flexibility allowed it to outlast its intended successor as the nature of the air war environment changed. Its early engines required so much fuel on any mission profile that adapting to low level was not particularly limiting, and as the nature of penetration changed from being elusive to interceptors to being invisible to radar, the B-52's large airframe and ample internal room made it relatively simple to add greatly improved electronic countermeasures suites. Additionally, no other aircraft had anything close to the B-52's bombload capacity when used in the tactical role. With improved coordination with ground spotters, B-52s with "big belly" modifications delivered up to 60,000 pounds (27,215 kg) of high explosive bombs during the Vietnam War. The same would not have been true of the Valkyrie, which featured a much smaller bombload of 25,000 pounds (11,000 kg) and would have had more limited uses in the conventional bombing role. That was not to say the B-52 was a perfect aircraft. Higher speed would aid even a low-level approach in the strategic role, something the F-111 was taking advantage of. In the high-load tactical role the aircraft was limited to a small number of airfields due to its very long takeoff roll. By the early 1960s the state of the art in engine and airframe design had improved considerably; an aircraft designed to match the B-52 in performance could meet both of these additional requirements as well. Although the B-52 had proven to be surprisingly adaptable in both the strategic and tactical roles, during the early 1960s a number of studies followed these technical developments in order to design a worthy B-52 replacement. The first post-B-70 study was known as the Subsonic Low Altitude Bomber (SLAB), which was completed in 1961. This was followed by the similar Extended Range Strike Aircraft (ERSA), which added a Variable-sweep wing planform, something then very much in vogue in the aviation industry. ERSA envisioned a relatively small aircraft with a 10,000 lb (4,500 kg) load and a range of 8,750 nautical miles (16,200 km), with 2,500 nmi (4,600 km) being flown at low altitudes. In August 1963 the similar Low-Altitude Manned Penetrator (LAMP) design was completed, which called for an aircraft with a 20,000 lb (9,000 kg) load and somewhat shorter range of 7,150 nautical miles (13,200 km). These all culminated in the October 1963 Advanced Manned Precision Strike System (AMPSS), which led to industry studies at Boeing, General Dynamics, and North American. In mid-1964, the USAF had revised its requirements and retitled the project as Advanced Manned Strategic Aircraft (AMSA), which differed from AMPSS primarily in that it also demanded a high-speed high-altitude capability, albeit slower than the Valkyrie at about Mach 2. Given the lengthy series of design studies, Rockwell engineers joked that the new name actually stood for "America's Most Studied Aircraft". The cancellation of the B-70 project had led some to question the need for a new strategic bomber at all. The Air Force was adamant about retaining bombers as part of the nuclear "Triad" concept that included bombers, SLBMs and ICBMs in a combined package that complicated any potential defense. But the arguments for keeping the bombers were hotly debated. The original argument was that the bombers could be kept in the air during times of increased defensive posture, where they would be difficult to attack. Missiles of the era, like the Atlas and Redstone, required a lengthy fuelling procedure immediately before launch, and were therefore vulnerable to air attack while still on the ground. They also had low accuracy; enough to attack cities as a strategic deterrent, but not enough to attack hardened military targets. To attack these targets, the bombers were required. In the early 1960s newer generations of missiles with solid rocket motors were being introduced that could be launched quickly, even faster than bombers, and were sited in underground silos for protection. Sneak attacks on these weapons would be very difficult for the USSR, which lacked the required accuracy in their own weapons and would have to use their bombers in order to be effective against them. US air defenses would have made such an attack extremely unlikely to succeed. Accuracy of the new weapons was so improved that direct attacks against similar weapons in the USSR were a real possibility, and attacks on other military bases were now possible. Making matters more troublesome for the Air Force was the introduction and rapid improvement of the U.S. Navy's SLBM force, which had considerably better survivability than either bombers or hardened missile silos. After this period the Air Force used a number of different arguments to make its case for the strategic bomber, including the conventional role and "recall-ability", but these arguments were much less convincing. One of the biggest critics of the bomber portion of the Triad was Secretary of Defense Robert McNamara who preferred ICBMs over bombers for the Air Force side of the deterrent force. In testimony before Congress, McNamara said, "The strategic missile forces for 1967-71 will provide more force than is required for 'Assured Destruction' ... a new advanced strategic aircraft does not at this time appear justified." His opposition led to the AMSA program being stopped in 1964. The program was revived only a few years later however, and in 1968 an advanced development contract was issued to IBM and North American Rockwell. McNamara remained opposed to the program in favor of upgrading the existing B-52 fleet, and adding just under 300 FB-111s for shorter range roles then being filled by the B-58. He vetoed the AMSA program and canceled it once again. President Richard Nixon re-established the program after taking office, in keeping with his administration's flexible response strategy that required a broad range of options short of general nuclear war (the "Schlesinger Doctrine"). Secretary of Defense Melvin Laird reviewed the programs and decided to lower the numbers of FB-111s claiming it lacked the required range, and recommended that the AMSA design studies be accelerated. In April 1969 the program officially became the B-1A. This was the first entry in the new bomber designation series, first created in 1962. After the prolonged development period, the production contract was finally awarded in 1970. The original program called for two test airframes, five flyable aircraft, and 40 engines. This was cut in 1971 to one ground- and three flight test aircraft (74-0158 through 0160). First flight was set for April 1974. The company changed its name to Rockwell International and named its aircraft division North American Aircraft Operations in 1973. A fourth prototype (76-1074) was ordered in the FY 1976 budget. This fourth aircraft was to be built to production standards. At one time, some 240 B-1As planned to be built, with initial operational capability set for 1979. Rockwell's design featured a number of features common to 1960s U.S. designs. These included the use of variable-sweep wings in order to provide both high lift during takeoff and landing, and low drag during a high-speed dash phase. With the wings set to their widest position the aircraft had considerably better lift and power than the B-52, allowing it to operate from a much wider variety of bases. Penetration of the USSR's defenses would take place in a dash, crossing them as quickly as possible before entering into the less defended "heartland" where speeds could be reduced again. The large size and fuel capacity of the design would allow this dash portion of the flight to be relatively long. In order to achieve the required Mach 2 performance at high altitudes, the air intake inlets were variable. In addition, the exhaust nozzles were fully variable. Initially, it had been expected that a Mach 1.2 performance could be achieved at low altitude, which required that titanium be used in critical areas in the fuselage and wing structure. However, this low altitude performance requirement was lowered to only Mach 0.85, reducing the amount of titanium, and the overall cost. Crew escape was provided for using an escape pod that ejected a portion of the entire cockpit with both pilots inside, as opposed to the more conventional ejection seats; it was felt that egress during a high-speed, high-altitude dash would be too dangerous without pressurization. A pair of small canards mounted near the nose are part of an active vibration damping system that smooths out the otherwise bumpy low-altitude ride, reducing crew fatigue and improving airframe life. An extensive suite of electronics was planned, including a Litton LN-15 inertial navigation system, a Doppler radar altimeter, a Hughes forward-looking infrared, a General Electric APQ-114 forward-looking radar and a Texas Instruments APQ-146 terrain-following radar. The terrain-following radar, in particular, would allow the B-1 to fly at much lower altitudes during the "dash" phase of the mission than the B-52, which relied on older systems that demanded higher minimum altitudes during bad weather. Overall it had a range similar to that of the B-52, although more of the flight could be low-level. A combination of flying lower due to better navigation systems and a greatly reduced radar cross section made it much safer from attack by missiles, and the latter also improved its odds against fighters as well. In situations where fighters were the expected competition (i.e. outside the USSR), its high-speed dash was a potentially useful technique the B-52 could not match. A convincing B-52 replacement had arrived. The B-1A mockup review occurred in late October 1971. There were 297 requests for alterations. The first of four prototype B-1A models (s/n 74-0158) flew on 23 December 1974. As the program continued the per-unit cost continued to rise. In 1970, the estimated per-unit price was $40 million, and by 1972, the cost had risen slightly to $45.6 million. By 1975, this figure had climbed to $70 million. In 1976 Viktor Belenko defected to Japan with his MiG-25 "Foxbat". During debriefing he described a new "super-Foxbat" (almost certainly referring to the MiG-31) that had look-down/shoot-down radar systems in order to attack cruise missiles. This would also make any low-level penetration aircraft "visible" and easy to attack. Countering this problem would require another upgrade to the electronic countermeasures suite, already one of the most complex and expensive ever fitted. The debate over the need for the bomber opened anew, and this time the reduced low-speed dash was a particular target. Given the performance and the armament suite that was similar to the B-52, the program was increasingly questioned as a very expensive solution that appeared to have limited benefits over the existing fleet. The program remained highly controversial. In particular, Senator William Proxmire continually derided it in public, arguing it was an outlandishly expensive dinosaur. During the 1976 federal election campaign, Jimmy Carter made it one of the Democratic Party's platforms, saying "The B-1 bomber is an example of a proposed system which should not be funded and would be wasteful of taxpayers' dollars." When Carter took office in 1977 he ordered a review of the entire program. By this point the projected cost of the program had risen to over $100 million per aircraft, although this was lifetime cost over 20 years. He was informed of the relatively new work on stealth aircraft that had started in 1975, and decided that this was a far better avenue of approach than the B-1. Pentagon officials also stated that the ALCM (Air Launched Cruise Missile) launched from the existing B-52 fleet would give the USAF equal capability of penetrating Soviet airspace. With a range of 1,500 miles (2,400 km), the ALCM could be launched well outside the range of any Soviet defenses, and penetrate at low altitude just like a bomber, but in much greater numbers. A small number of B-52 operating outside interception range could launch hundreds of ALCMs, saturating the defense. A program to improve the B-52 and develop and deploy the ALCM would cost perhaps 20% of the price to deploy the planned 244 B-1As. On 30 June 1977 Carter announced that the B-1A would be canceled in favor of ICBMs, SLBMs, and a fleet of modernized B-52s armed with ALCMs. Carter called it "one of the most difficult decisions that I've made since I've been in office." No mention of the stealth work was made public, the program being top secret, but today it is known that he authorized the Advanced Technology Bomber (ATB) project in early 1978, which eventually led to the B-2 Spirit. Unsurprisingly, the reaction to the cancellation was split along partisan lines. Robert Dornan claimed, "They're breaking out the vodka and caviar in Moscow." In contrast, it appears the Soviets were not at all excited by this development, considering a large number of ALCMs represented a much greater threat than a smaller number of B-1s. Tass commented that "the implementation of these militaristic plans has seriously complicated efforts for the limitation of the strategic arms race." Western military leaders were generally happy with the decision. Alexander Haig, then commanding NATO, described the ALCM as an "attractive alternative" to the B-1. French General Georges Buis stated "The B-1 is a formidable weapon, but not terribly useful. For the price of one bomber, you can have 200 cruise missiles." Flight tests of the four B-1A prototypes for the B-1A program continued through April 1981. The program included 70 flights totalling 378 hours. A top speed of Mach 2.22 was reached by the second B-1A. Engine testing also continued during this time with the YF101 engines totalling almost 7,600 hours. It was during this period that the Soviets, also acting in proxy through Cuba, started to exert themselves in several new theaters of action, in particular the Cuban support in Angola starting in 1975 and the Soviet invasion of Afghanistan in 1979. The U.S. strategy to this point was containment and a conventional and nuclear war in Europe, which almost all military planning had been focused on. These newer actions revealed that the military was simply incapable of supporting any sort of effort outside these narrow confines. The Army responded by accelerating its Rapid Deployment Force concept, but suffered from major problems with airlift and sealift capability. While gaming a USSR-led invasion of Iran from Afghanistan, then considered (incorrectly) to be a major Soviet goal, it was discovered that only small numbers of units could be in the field in anything close to a week. In order to slow an advance while this happened they relied on air power, but critically the Iran-Afghanistan border was outside the U.S. Navy's range, leaving this role to the Air Force. They, in turn, had limited capability to offer ground support in many areas that were outside the range of friendly airbases. Although the B-52 had the range to support on-demand global missions, the B-52's long runway requirements dramatically limited the forward basing possibilities. In real-world scenarios the capabilities of this force against any given potential target was limited, something the B-1 would be better prepared to handle due to its better takeoff performance and range. During the 1980 presidential campaign, Ronald Reagan campaigned heavily on the platform that Carter was weak on defense, using the cancellation of the B-1 program as a prime example, a theme he continued using into the 1980s. During this time Carter's defense secretary, Harold Brown, announced the stealth bomber project, apparently implying that this was the reason for the B-1 cancellation. Brown later denied this claim, stating Carter was simply opposed to any military buildup. Although Reagan's primary attack on Carter's decision was now rendered moot, he immediately changed his complaint saying that Carter was giving away secrets and politicizing the Pentagon, charges that led to a round of sparring between Brown and Reagan in the press. Interestingly, it was Brown that had led the original AMSA program, but later came to prefer the cruise missile after taking the job of Defense Secretary in 1977. On taking office, Reagan was faced with the same decision as Carter before; whether to continue with the B-1 for the short term, or to wait for the development of the ATB, a much more advanced aircraft. He decided to do both. Air Force studies suggested that the existing B-52 fleet with ALCM would remain a credible threat until 1985 , as it was predicted that 75% of the B-52 force would survive to attack its targets. After this period the introduction of the SA-10 missile, MiG-31 interceptor and the first Soviet AWACS systems would make them increasingly vulnerable. During the FY81 budget funds were given to a new study for a bomber for the 1990s time-frame. These studies led to the Long-Range Combat Aircraft (LRCA) project which compared the B-1, F-111 and ATB as possible solutions. An emphasis was placed on the design being multi-role, as opposed to a purely strategic weapon. At the time it was believed the B-1 could be in operation before the B-2, covering the time period between the B-52s increasing vulnerability and the introduction of the ATB. Reagan decided the best solution was to purchase both the B-1 and ATB, and this eventually led to Reagan's 2 October 1981 announcement that a new version of the B-1 was being ordered to fill the LRCA role. Numerous changes were made to the design to better fit it to real-world missions, resulting in the new B-1B. These changes included a reduction in maximum speed, which allowed the variable-aspect intake ramps to be replaced by simpler fixed geometry intake ramps in the newer design. This reduced the B version's radar signature because the compressor faces of the engines, major radar reflectors, would be partially hidden. Low-altitude speed was somewhat improved, from about Mach 0.85 to 0.92. This left the B-1B with the capability for speeds of about Mach 1.25 "at altitude", a reduction from the B-1A's Mach 2 performance. The B-1B's maximum takeoff weight was increased to 477,000 lb (216,000 kg) from the B-1A's 395,000 lb (179,000 kg). The weight increase was to allow for takeoffs with full fuel tanks and for weapons to be carried externally. Rockwell engineers were able to reinforce critical areas and lighten non-critical areas of the airframe so the increase in empty weight was minimal. In order to deal with the introduction of the MiG-31 and other aircraft with look-down capability, the B-1B's electronic warfare suite was significantly upgraded. These changes, along with the rampant inflation of the U.S. economy during the time, dramatically increased the nominal price to about $200 million total projected lifetime cost per completed airframe. Opposition to the plan was widespread within Congress. Critics pointed out that many of the original problems with the concept remained. In particular it seemed the B-52 fitted with electronics similar to the B-1B would be equally able to avoid interception, as the speed advantage of the B-1 was now minimal. It also appeared that the "interim" time frame served by the B-1B would be less than a decade, being rendered obsolete shortly after introduction by the much more capable ATB design. The primary argument in favor of the B-1 was its large conventional payload, and that its takeoff performance allowed it to operate with a credible bombload from a much wider variety of airfields. The debate remained rancorous. But the Air Force very astutely spread production subcontracts across many congressional districts, making the aircraft more popular on Capitol Hill. The first production model of the revised B-1B first flew in October 1984, and the first B-1B, "The Star of Abilene", was delivered to Dyess Air Force Base, Abilene, Texas, in June 1985, with initial operational capability on 1 October, 1986. The 100th and final B-1B was delivered 2 May 1988. The B-1 has a blended wing body configuration, with variable-sweep wing, triangular fin control surfaces and four turbofan engines, to improve range and speed with enhanced survivability. Forward-swept wing settings are used for takeoff, landings and high-altitude maximum cruise. Aft-swept wing settings are used in high subsonic and supersonic flight. The wings of the B-1B originally were cleared for use at settings of 15, 25, 55, and 67.5 degrees. The 45-degree setting was later cleared in 1998–99 timeframe. The length of the aircraft presented a serious flexing problem due to air turbulence at low altitude. To alleviate this, Rockwell included small canards near the nose on the B-1. An accelerometer would actuate the canards automatically to counteract turbulence and smooth out the ride. Unlike the B-1A, the B-1B made no attempt at Mach 2+ speeds. Its maximum speed at altitude is Mach 1.25 (about 950 mph or 1,530 km/h), but its low-level speed increased to Mach 0.92 (700 mph, 1,130 km/h). Technically, the current version of the aircraft can exceed its speed restriction, but not without risking potential damage to its structure and air intakes. The B-1A's engine was modified slightly to produce the F101-102, with an emphasis on durability, and increased efficiency. The core of this engine has since been re-used in several other engine designs, including the F110 which has seen use in the F-14 Tomcat, F-15K/SG variants and most recent versions of the F-16 Fighting Falcon. It is also the basis for the non-afterburning F118 used in the B-2 Spirit bomber and the U-2S. However its greatest success was forming the core of the extremely popular CFM56 civil engine, which can be found on some versions of practically every small-to-medium sized airliner. The nose gear cover door has controls for the auxiliary power units (APUs), main gear doors and nearby entry ladder. One of controls there allows for quick starts of the APUs upon order to scramble. The B-1's offensive avionics include the Westinghouse (now Northrop Grumman) AN/APQ-164 forward-looking offensive passive electronically scanned array radar set with electronic beam steering (and a fixed antenna pointed downward for reduced radar observability), synthetic aperture radar, ground moving target indicator (MTI), and terrain-following radar modes, Doppler navigation, radar altimeter, and an inertial navigation suite. From 1995 on, the B-1B Block D upgrade added a Global Positioning System receiver. The B-1's defensive electronics include the Eaton AN/ALQ-161 radar warning and defensive jamming equipment, linked to a total of eight AN/ALE-49 flare dispensers located on top behind the canopy, which are handled by the AN/ASQ-184 avionics management system. The AN/ALE-49 dispenser has a capacity of 12 MJU-23A/B flares each. The MJU-23A/B flare is one of the world's largest infrared countermeasure flares having a gross weight of ~1170 g. The cylindrical Magnesium/Teflon/Viton pellet has a net weight of ~1470 g. The Plans for a defensive systems upgrade program (DSUP) were canceled for budgetary reasons. The B-1 has also been equipped to carry the ALE-50 Towed Decoy System. The Lancer has an additional Doppler tail-warning radar to detect aircraft or missiles approaching from the rear. Also aiding the B-1's survivability is its relatively low radar cross-section (RCS). Although not technically a stealth aircraft in a comprehensive sense, thanks to the aircraft's structure, serpentine intake paths and use of radar-absorbent material its RCS is about 1/50th that of the B-52 (probably about 26 ft² or 2.4 m²), although the Lancer is not substantially smaller in mass than the Stratofortress. A B-1B at the 2006 Miramar Airshow. The B-1 has been upgraded since production through the "Conventional Mission Upgrade Program". This multi-stage program added a new MIL-STD-1760 smart-weapons interface that enables the use of the Joint Direct Attack Munition and other precision-guided conventional weapons, such as the Wind Corrected Munitions Dispenser (WCMD), the AGM-154 Joint Standoff Weapon (JSOW), and the AGM-158 JASSM (Joint Air to Surface Standoff Munition). Future precision munitions include the GBU-39 Small Diameter Bomb. These and other improvements are intended to ensure that the B-1 will be viable through approximately 2020. In addition, the Air Force has recently announced a program to keep the aircraft flying until at least 2040. The USAF Strategic Air Command (SAC) had B-1 Lancers in service from 1986 through 1992, when SAC was re-organized out of existence. During that time the "Bone" was on limited alert, and the backbone of SAC's alert bombers remained B-52H models. In late 1990 engine fires in two Lancers caused the grounding of the fleet. The cause was traced back to problems in the first-stage fan. Aircraft were placed on "limited alert", meaning they were grounded unless a nuclear war broke out. They were returned to duty one-at-a-time starting in January 1991 as they were inspected and repaired. It was not until mid-April that the fleet was once again declared airworthy. Although officially named the "Lancer", B-1 crews almost never refer to the aircraft by this name. Crews prefer to call the B-1 the "Bone". Origins of the "Bone" nickname are disputed, but appear to stem from an early newspaper article about the aircraft wherein its name was phonetically spelled out as "B-ONE" and inadvertently omitted the hyphen. Crews, who generally felt the "Lancer" moniker was unappealing, quickly latched onto the "Bone" nickname. Originally designed strictly for nuclear war, the B-1's development as an effective conventional bomber was delayed until the 1990s. By 1991, the B-1 had a fledgling conventional capability, forty of them able to drop the 500 lb (230 kg) Mk-82 General Purpose (GP) bomb, although mostly from low altitude. Although cleared for this role, the problems with the engines precluded their use in Operation Desert Storm. Also, B-1s were reserved for strategic nuclear strike missions at this time. After the absorption of Strategic Air Command (SAC) into Air Combat Command (ACC) in 1992, the B-1 began to truly develop conventionally. A key part of this development was the start-up of the B-1 Weapons School Division, also in 1992. By the mid-1990s, the B-1 could employ GP weapons as well as various CBUs. By the end of the 1990s, with the advent of the "Block D" upgrade, the B-1 boasted a full array of guided and unguided munitions. This development has continued through the present. The B-1B no longer carries nuclear weapons, and the B-1 fleet did not have nuclear capability by 1995 with the removal of nuclear arming and fuzing hardware. Crew members transfer a 2,000 pound (900 kg) GBU-31 Joint Direct Attack Munition (JDAM) to a lift truck for loading onto a B-1B on 29 March 2007, in Southwest Asia in support of combat operations. Operationally, the B-1 was first used in combat in support of operations against Iraq during Operation Desert Fox in December 1998, employing unguided GP weapons. 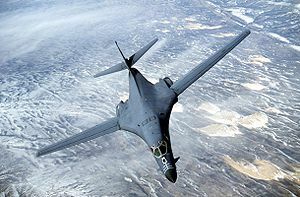 B-1s have been subsequently used in Operation Allied Force (Kosovo) and most notably in Operation Enduring Freedom in Afghanistan and the 2003 invasion of Iraq. In both conflicts, the B-1 employed its full array of conventional weapons, most notably the GBU-31, 2,000 lb (900 kg) Joint Direct Attack Munition (JDAM). During OEF, the B-1 improved its mission capable rate to 79%. The B-1 continues to be used in combat to the present day. The most recent addition to its arsenal is the GBU-38, a 500 lb (230 kg) JDAM. The use of the GBU-38 reduces undesired collateral damage and is very useful in urban Close Air Support. The B-1 now fills an important niche in the Air Force inventory. The project finished on budget, and the B-1 has higher survivability and speed when compared to the older B-52, which it was intended to replace. With the arrival of limited numbers of B-2s in the 1990s and the continuing use of B-52s, its value has been questioned. However, the capability of a high-speed strike with a large bomb payload for time-sensitive operations is useful, and no new strategic bomber is on the immediate horizon. The B-1 holds several FAI world records for speed, and time-to-climb in different aircraft weight classes. The National Aeronautic Association recognized the B-1B for completing one of the 10 most memorable record flights for 1994. A total of 100 B-1Bs were produced with 93 bombers remaining in 2000 after losses in accidents. In 2003, following the removal of the B-1B from two bomb wings in the Air National Guard, the USAF decided to retire 33 of the B-1Bs to concentrate its budget on maintaining availability of the remaining aircraft, although in 2004 a new appropriations bill called for some of the retired aircraft to return to service. In 2004, the USAF returned seven of the mothballed bombers to service, giving a total force of 67 aircraft, with the rest cannibalized for spares. Five of the seven that were brought back to service went to Dyess AFB in Texas, one to Ellsworth AFB, South Dakota, and another to Edwards AFB, California. On 14 July 2007, the Associated Press reported on the growing USAF presence in Iraq as a result of "surge" in forces. Also mentioned is the reintroduction of B-1Bs to be a close-at-hand "platform" to support Coalition ground forces. As of 2008, the B-1 is being used in Iraq in close support of ground troops by delivering precision-guided bombs. On 19 March 2008, a B-1B from Dyess Air Force Base, Texas, became the first US Air Force aircraft to fly at supersonic speed using a synthetic fuel during a flight over Texas and New Mexico. The B-1B is undergoing flight testing using a 50/50 mix of synthetic and petroleum fuel as part of an ongoing Air Force testing program. On 4 August 2008, a B-1B flew the first Sniper Advanced Targeting Pod equipped combat sortie where the crew successfully targeted enemy ground forces and dropped a GBU-38 guided bomb in Afghanistan. The B-1A was original B-1 design with variable engine intakes and Mach 2.2 top speed. Four prototypes were built. The B-1B is the improved B-1 design with reduced radar signature and a top speed of Mach 1.25. A total of 100 B-1Bs were produced. The B-1R is a proposed replacement for the B-1B fleet. Boeing's director of global strike integration, Rich Parke, was first quoted about the "B-1R" bomber in Air Force Magazine. Parke said the B-1R (R stands for "regional") would be a Lancer with advanced radars, air-to-air missiles, and Pratt & Whitney F119 engines (originally developed for the F-22 Raptor). Its new top speed of Mach 2.2 would be purchased at the price of a 20% reduction of the B-1B's combat range. This proposal would involve modifying existing aircraft. The FB-22 and YF-23-based design are alternative proposals. Boeing's proposal appears to modify the B-1B into a design able to serve these two purposes. For the bomb-truck role Boeing proposes the modification of existing external hardpoints to allow them to carry multiple conventional warheads, dramatically improving overall warload. For the air-to-air role, both defensive and offensive, they propose to add active electronically-scanned array radar and allow some of the hardpoints to carry anti-aircraft missiles. Even with its somewhat reduced range as compared to the original B-1B, its fuel capacity remains quite large. This would allow it to escape from unfavorable air-to-air encounters by simply running away; there are few enough aircraft capable of Mach 2+ performance in general, and those that are deployed can maintain these speeds for only very short periods of time. In general terms the B-1R most closely resembles the original F-111 concept, as opposed to a pure bomber role. However, it would be able to carry out these missions at ranges even greater than the F-111. The Conventional Mission Upgrade Program (CMUP) will enhance the airplane's effectiveness as a conventional weapons carrier. Capability will be delivered in blocks attained by hardware modifications and software updates. Block A: Standard design of the B-1B with the capability to deliver non-precision Mk-82 500 lb gravity bombs. Before CMUP all B-1Bs were designated as "Block A" models. Block B: Improved Synthetic Aperture Radar, as well as some upgrades to the Defensive Countermeasures System. This upgrade reached the field in 1995. Block C: "Enhanced Capability" provided for delivery of up to 30 Cluster Bomb Units (CBUs) per sortie. The upgrade consists of modification for B-1B bomb module from the original configuration of 28 x 500 lb bombs per unit to 10 x 1,000 lb cluster bombs per bomb rack. The modifications were made to 50 bomb racks. This capability was completed in August 1997. Block D: "Near Precision Capability" gives B-1 aircrews increased abilities to accurately put bombs on target with improved weapons and targeting systems, as well as giving them advanced secure communications capabilities. The first part of the electronic countermeasures upgrade, addition of Joint Direct Attack Munitions (JDAM), ALE-50 Towed Decoy System, and anti-jam radios are also included. Block E: This upgrade covers improvements to the avionics computers. This package also incorporates the Wind-Corrected Munitions Dispenser (WCMD), the Joint Standoff Weapon (JSOW) and the Joint Air-to-Surface Standoff Missile (JASSM), substantially improving the bomber's capability. Upgrades were completed in September 2006. Block F: The Defensive Systems Upgrade Program (DSUP) improves the aircraft's electronic countermeasures and jamming capabilities. This includes the Towed Decoy System (TDS). Upgrades were canceled in December 2002 due to cost overruns and schedule slips. After the CMUP program, upgrades will provide for better network centric capability. A program was begun in 2005 to provide integrated data linking and upgraded crew station displays. Integration of the Sniper targeting pod is underway. The pod is mounted on an external hardpoint at the aircraft's chin near the forward bomb bay. Due to accelerated testing the Sniper pod was fielded in summer 2008. The first B-1A (s/n 74-0158) was disassembled and used for radar testing at the Rome Air Development Center, New York. The second B-1A (s/n 74-0159) flew for the subsequent B-1B program, but crashed on 29 August 1984 (see below). The third B-1A (s/n 74-0160) is on display at Wings Over the Rockies Museum in Denver, Colorado. The fourth and last B-1A (s/n 74-0174) was on display at the National Museum of the United States Air Force near Dayton, Ohio for many years before moving to the Strategic Air and Space Museum in Ashland, Nebraska. This aircraft has conventional ejection seats and other features distinctive to the B-1B variant instead of the B-1A. B-1B (s/n 83-0069, Lot II) is on display the the Museum of Aviation at Robins Air Force Base in Warner Robins, GA. This aircraft was the sixth B-1 produced, and was delivered to the 96th Bomb Wing at Dyess AFB Texas on March 13, 1986. The aircraft was originally given the name Silent Penetrator, but was later named Rebel and painted with the nose art of a WWII B-29 Superfortress assigned to the 497 Bomb Group. This aircraft arrived at Robins Air Force Base in September 2002 from Dyess Air Force Base in Texas. As of May 31, 1992, the aircraft had accumulated 1393.0 flight hours. The aircraft is displayed outside the museum entrance near the parking lot. B-1B (s/n 84-0051, Lot III) is on display at the National Museum of the United States Air Force in Dayton, Ohio. It is displayed in the Museum's Cold War Gallery, and replaces the B-1A (74-0174) formerly on display. Between 1984 and 2001, 17 people have been killed in B-1 crashes. On 29 August 1984, B-1A (s/n 74-0159) stalled and crashed while performing minimum control speed tests at low altitude. The crew used the escape capsule to leave the bomber, but the parachute deployed improperly and the pilot, Doug Benefield, was killed on impact. In September 1987, B-1B (s/n 84-0052) from the 96th Bomb Wing, 338th Bomb Squadron, Dyess AFB crashed near La Junta, Colorado, while flying on a low-level training route. This was the only B-1B crash to occur with six crew members aboard. The two crew members in jump seats, and one of the four crew members in ejection seats perished. The crash investigation revealed that malfunctioning logic chips may have caused the fourth ejection seat to fail. The root cause of the accident was thought to be a bird strike on a wing's leading edge during the low-level flight. The impact was severe enough to sever the fuel and hydraulic lines running along the forward spar that served that side of the aircraft, whereas the other side and its two engines functioned long enough to enable the three crew members to eject. The B-1B fleet was later modified to protect the various supply lines, which lie along the edge. In November 1988, B-1B (s/n 85-0063) from the 96th Bomb Wing, 337th Bomb Squadron, Dyess AFB crashed near Tye, Texas after a fire broke out above left engines. All four crew members successfully ejected from the aircraft. In November 1988, B-1B (s/n 85-0076) from the 28th Bomb Wing, 37th Bomb Squadron, Ellsworth AFB crashed short of the runway at Ellsworth AFB during adverse weather. All four crew members successfully ejected from the aircraft. In October 1990, while flying in a training route in eastern Colorado, B-1B (s/n 86-0128) from the 384th Bomb Wing, 28th Bomb Squadron, McConnell AFB, experienced an explosion as the engines reached military power. Fire on the aircraft's left was spotted. The #1 engine was shut down and its fire extinguisher was activated. The accident investigation determined that the engine had suffered catastrophic failure, in which engine blades cut through the engine mounts, causing the engine to detach from the aircraft. In December 1990, B-1B (s/n 83-0071) from the 96th Bomb Wing, 337th Bomb Squadron, Dyess AFB, Texas experienced a jolt and the #3 engine was shut down with its fire extinguisher activating. This event, coupled with the October 1990 engine incident, led to a 50+ day grounding of the B-1Bs not on nuclear alert. The problem was eventually traced back to problems in the first-stage fan, and all B-1Bs were equipped with modified engines. In November 1992, B-1B (s/n 86-0106) from the 7th Bomb Wing, 337th Bomb Squadron, Dyess AFB, Texas flying on a low-level training flight crashed into a mountain near Van Horn, Texas. All four members of the crew were killed. The cause was attributed to pilot error. In September 1997, B-1B (s/n 85-0078) from the 28th Bomb Wing, 37th Bomb Squadron, Ellsworth AFB, South Dakota, flying in the Powder River Military Operating Area crashed near Alzada, Montana, approximately 80 miles north of Rapid City, South Dakota. All four members of the crew were killed. The review board found the bomber struck the ground while decreasing speed and making an abrupt turn to evade a threat. In February 1998, B-1B (s/n 84-0057) from the 7th Bomb Wing, Dyess AFB, Texas crashed near Marion, Kentucky when a fire detected by a cockpit instrument panel shut down the aircraft's power. All four crew members were able to eject and were rescued safely. In response to a warning light on the #3 engine, the crew shut down the fuel pumps to that engine. However, a panel electrical short caused a fire that shut down fuel to all the engines and prevented them from being restarted. In December 2001, B-1B (s/n 86-0114) from the 28th Bomb Wing, 37th Bomb Squadron, Ellsworth AFB, South Dakota, was lost over the Indian Ocean. All four crew members successfully ejected and were rescued. The bomber (of the 28th Bomb Wing, designated ICECUBE 44) was approximately 100 miles north of its Diego Garcia departure point, flying en route to a long-range combat mission over Afghanistan, when the crew declared an in-flight emergency. Details remain classified. The pilot, Capt. William Steele, attributed the crash to "multiple malfunctions" causing the bomber to go "out of control". Further information from maintenance specialists related the aircraft mishap to the aircrew experiencing electrical bus failures that contributed to an instrument blackout affecting both primary and backup instruments. With no visual reference of level flight available to the aircrew, the four crew members ejected safely. Because of the depth of the water in which the aircraft crashed, the structural data collector (SDC) or "Black Box" was not recovered from the wreckage and the nature of the cause was not positively determined. The aircraft had recently returned from Ellsworth AFB from a routine Phase Inspection, and was on its first combat mission after returning to Diego Garcia. The crew spent two hours in the water before being rescued by a launch from the USS Russell. This was the first B-1B to be lost in combat operations since the model became operational in 1986. On 15 September 2005 B-1B (s/n 85-0066) was extensively damaged by fire while landing at Andersen Air Force Base, Guam. The investigation into the incident concluded that leaking hydraulic fluid and sparks from a wheel being gouged caused a fire to start in the aircraft's right main landing gear as it touched down. The resulting fire damaged the B-1's right wing, nacelle, airframe and landing gear, leading to an estimated repair cost of more than $32 million. In May 2006, B-1B (s/n 86-0132) from the 7th Bomb Wing, 9th Bomb Squadron, Dyess AFB, Texas, landed "gear-up" during recovery from an 11-hour ferry flight to Diego Garcia. A resulting fire was quickly extinguished and the crew escaped through the top hatch. The copilot suffered a minor back injury; the three other crew members were not injured. The Air Force investigation concluded that the pilots disabled the aural tone generator circuit breaker which creates audiable warning signals and then "forgot to lower the landing gear". Damage to the aircraft and runway totaled approximately $8 million. Four days later the aircraft was raised and its landing gear deployed. The B-1B returned to normal service in 2007. In August 2007, a B-1B had an engine fire and made an emergency landing at Kandahar airport in Afghanistan. Crews removed the damaged engine and flew the aircraft out in October. On 4 April 2008, a B-1B lost hydraulic power while taxiing, then crashed into a concrete barrier and caught fire at Al Udeid AB,Qatar. The crew safely evacuated the aircraft. The plane was carrying multiple bombs at the time, all but two of which detonated during the fire. The aircraft was a total loss. Hardpoints: six external hardpoints for 59,000 lb (27,000 kg) of ordnance (use for weapons currently restricted by START I treaty) and 3 internal bomb bays for 75,000 lb (34,000 kg) of ordnance. The B-1 and B-52 bombers have been featured frequently in author Dale Brown's books. A B-1 carries the President to NORAD, during an alien invasion in the Larry Niven and Jerry Pournelle science fiction novel Footfall. The unofficial 1983 James Bond film Never Say Never Again features a cruise missile launch from a B-1 (although a sequence in which cruise missiles are loaded onto the B-1 was filmed with a Concorde SST substituting for the B-1's undercarriage). In the 1985 film Real Genius, the laser weapon that is developed by Chris Knight is mounted in a B-1's bomb bay. 1. Mehuron, Tamar A., Assoc. Editor. "The Air Force in Facts and Figures - 2008 USAF Almanac". Air Force Magazine, Journal of the Air Force Association, Vol. 91, Issue 5, May 2008. ISSN 0730-6784. 2. a b B-1A background, Globalsecurity.org. 3. Jenkins 1999, p. 10. 4. Spick 1986, pp. 6-7. 5. North American Rockwell, NASA-CR-115702, B-70 Aircraft Study Final Report, Vol. I, p. I-38, NASA, 1972. 7. Knaack, 1988, p. 256. 9. a b c d e f Rockwell B-1A, J Baugher, 10 October 2001. 10. "The Evolution of a Strategic Bomber"
11. a b B-1A page, fas.org. Retrieved: 20 March 2008. 15. Northrop B-2A Spirit, J Baugher, 16 October 2001. 16. Jenkins 1999, p. 46. 20. Goebel, Greg. "The Rockwell B-1, B-1B Described", Vectorsite.net, 1 July 2006. 21. Spick 1986, p. 28. 22. "AIAA-1972-772, B-1 Structural Mode Control System", American Institute of Aeronautics and Astronautics (AIAA), 9 August 1972. 23. Jenkins 1999, p. 60. 24. a b Pace 1998, p. 64. 25. Spick 1987, p. 498. 26. Pace 1998, p. 44. 27. Spick 1986, p. 44. 28. J. A. Humphries and D. E. Miller. AIAA-1997-2963: B-1B/MJU-23 flare strike test program. American Institute of Aeronautics and Astronautics, AIAA/ASME/SAE/ASEE Joint Propulsion Conference and Exhibit, 33rd, Seattle, WA, 6 - 9 July 1997. 29. a b c d B-1B USAF fact sheet, U.S. Air Force. 30. Wicke, Russell. "ACC declares small diameter bomb initially operational", U.S. Air Force, 5 October 2006. 31. Jenkins 1999, p. 67. 32. Rockwell B-1B Lancer, J Baugher, 12 October 2001. 33. "B-1B Lancer Strategic Bomber, USA". airforce-technology.com. http://www.airforce-technology.com/projects/b-1b/. Retrieved on 2009-03-09. 34. Jenkins 1999, p. 141. 35. Jenkins 1999, Appendix E.
36. Mehuron, Tamar A., Assoc. Editor. 2005 USAF Almanac: Facts and Figures" (data as of 30 Sept. 2004). Air Force Magazine, May 2005. 37. Associated Press. Air Force Quietly Building Iraq Presence,14 July 2007. 38. "B-1 performs as never envisioned after 20 years", US Air Force, 17 April 2008. 39. Bates, Matthew. "B-1B achieves first supersonic flight using synthetic fuel". Air Force News, 20 March 2008. 40. a b c Pate, Capt. Kristen. "Sniper ATP-equipped B-1B has combat first", US Air Force, 11 August 2008. 41. a b Lewis, Paul and Simonsen, Erik. "Offering Unique Solutions for Global Strike Force". All Systems Go (Boeing) Vol. 2, Issue 2, 2004. Retrieved: 18 July 2006. 42. a b Hebert, Adam J. "Long-Range Strike in a Hurry". Air Force Magazine. 43. B-1B Variants and upgrade blocks, Globalsecurity.org, retrieved 12 September 2007. 44. Boeing Block D Upgrades, Boeing, 4 December 1998. 45. Boeing 2006 Block E Upgrades, Boeing, 27 September 2006. 46. Block F Upgrades, US Air Force, 21 January 2003. 47. Young, Susan H."Gallery of USAF Weapons", Air Force Magazine, May 2008. 48. Hernandez, Jason. "419th FLTS demonstrates Sniper pod capability", US Air Force, 23 February 2007. 49. La Rue, Nori. "B-1 Sniper pod aims to hit summer target", US Air Force, 4 June 2008. 51. a b The Crash of the B-1A (29 August 1984), Check-Six.com. 52. a b c Associated Press. "Bomber Crew Rescued from Sea". USA Today, 12 December 2001. Retrieved 18 July 2006. 53. B-1A accident in 1984, thexhunters.com. 54. a b c d e f g Jenkins 1999, p. 114–116. 56. "4 die in crash of B-1 bomber in Montana, Air Force moves up stand down to Monday", CNN, 19 September 1997. 57. "Crew parachutes from B-1B bomber just before crash", CNN, 18 February 2002. 58. IN BRIEF News in Brief, 16 January 2001 Retrieved: 18 July 2006. 59. Squadron Service - 2001 to present, retrieved 12 January 2007. 60. Report: pilot error caused B-1B crash, Air Combat Command Public Affairs , USAF, 18 September 2006. Retrieved: 1 December 2006. 61. Recovery of B-1B "SLIP 57", zianet.com. Retrieved: 1 December 2006. 62. Making a Three Engine B-1 Take Off, StrategyPage.com, 31 October 2007. 63. "Brake failure caused B-1B crash in Qatar", Air Force Times accident report, 6 October 2008. Includes photographs and video. 67. "Bad to the B-ONE", Air Force Magazine, March 2007, p. 63. 68. a b c Jenkins 1999, p. 142. 73. Tirpak, John A. "The Big Squeeze". Air Force Magazine, Journal of the Air Force Association, Volume 90, Issue 10, October 2007. ISSN: 0730-6784. 74. "B-1 crews conduct TWF test; receive pod spin-up", US Air Force, 29 February 2008. Jenkins, Dennis R. B-1 Lancer, The Most Complicated Warplane Ever Developed. New York: McGraw-Hill, 1999. ISBN 0-07-134694-5. Pace, Steve. Boeing North American B-1 Lancer. North Branch, Minnesota: Specialty Press, 1998. ISBN 1-58007-012-4. Spick, Mike. Modern Fighting Aircraft, B-1B. New York: Prentice Hall, 1986. ISBN 0-13-055237-2. Spick, Mike, ed. The Great Book of Modern Warplanes, First edition. New York: Salamander Books, 1987. ISBN 0-517-63367-1. Winchester, Jim, ed. "Rockwell B-1A." Military Aircraft of the Cold War (The Aviation Factfile). London: Grange Books plc, 2006. ISBN 1-84013-929-3. The Rockwell B-1B Lancer is also referred to as: 1 b lancer, b 1 b lancer, b 1 aircraft, b1 bomber, b1b bomber, b1a bomber, bomber b 1, and the lancer bomber.